“Witch hazel is a shrub that everybody in New England, who goes into the woodland, knows by sight. Its botanical term is Hamamelis Virginica, given it many years ago in honor of the early settlers of Virginia, who, before ascertaining the medical worth of the leaves and bark, used the twigs with success as divining rods”. Witch hazel was described as growing from eight to fifteen feet by the age of five or six years. It was not to be confused with a much shorter shrub (rarely more than five feet tall) by the name of hazel – the latter was the nut-bearing hazelnut. The two are not related although witch hazel seeds/nuts are also edible. The plant goes by several other names including spotted alder, striped alder, tobacco-wood, winter-bloom, snapping-hazel, and, of course, Southern witch-hazel. About November witch hazel trees have tiny yellow flowers emerge that expand throughout winter. There are “nubbins”, one might refer to as nuts or seeds, which are interspersed amongst the blooms. Witch hazel has a rather unusual way of dispersing its seed. The seeds are kept over winter and ripen them the next fall when its flowers are expanding… “when the pod bursts open, snapping them several feet away. If the branches are gathered before the seeds are scattered the pods will open in the house and throw their seeds across the room.” Most sources noted seeds being flung 10 to 20 feet, but Gibson claimed he’d seen them thrown up to 45 feet away from the host shrub. – Dowd, Mary Alice. Our Common Wild Flowers at Springtime and Autumn. 1906. Boston. After an encounter with it William Hamilton Gibson said of witch hazel: “I had been attracted by a bush which showed an unusual profusion of bloom and while standing close beside it in admiration I was suddenly stung on the cheek by some missile and the next instant shot in the eye by another, the mysterious marksman having apparently let go both barrels of his little gun directly in my face. I soon discovered him, an army of them,–in fact a saucy legion, all grinning with open mouths and white teeth exposed and their double-barreled guns loaded to the muzzle ready to shoot whenever the whim should take them”. – The Nature Study Review. Nov. 1919. 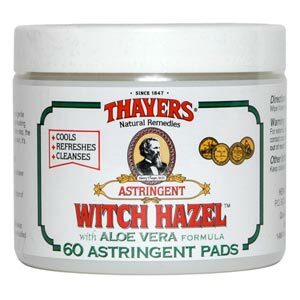 “Medicinally, witch hazel is an astringent. Both bark and leaves contain tannic acid in large quantities, but the greater percentage is in the bark.” The bark was stripped off and distilled for its oil. It was used for treating acute derangements of the stomach. How often was it taken? 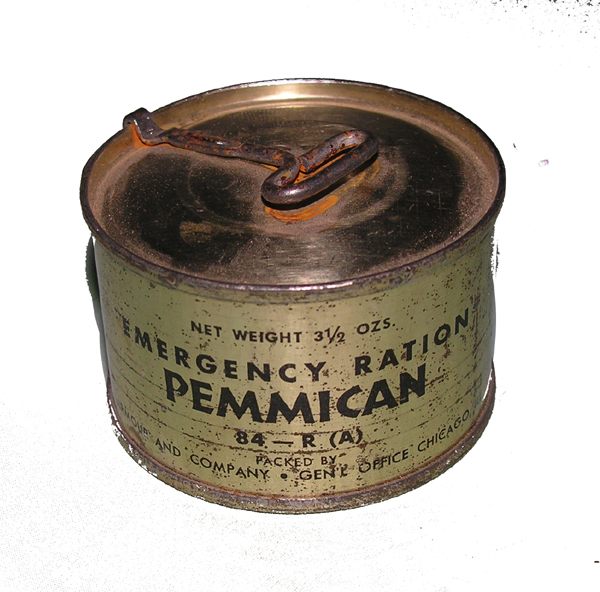 “People do not buy it by the four or eight-ounce bottle now, but by the quart or gallon, and every medicine chest is not properly equipped unless it has a liberal supply…”. – Good Housekeeping. Aug. 1894. North American witch hazel was named for its resemblance to the English and Scottish Witch or Wych elm which produced a rather large, though seldom straight tree. The Witch elm was used for bent-wood work, boat frames, etc. 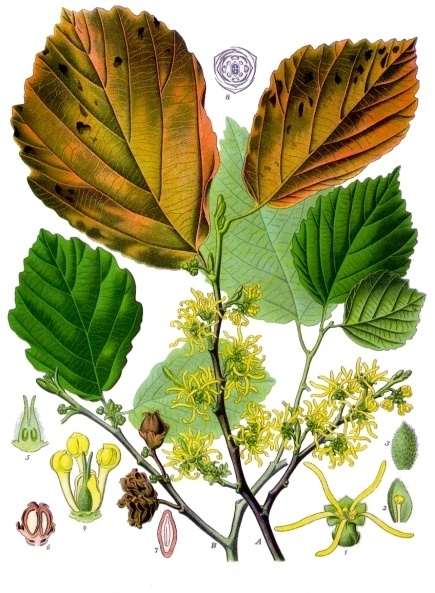 The wych-elm or Eurasian elm Ulmus glabra, has large rough leaves, grows primarily in woodlands or near flowing water. It has clusters of flowers and winged fruits. The old English prefix wych, or witch meant “bend”)so named because the tree had pliant branches. 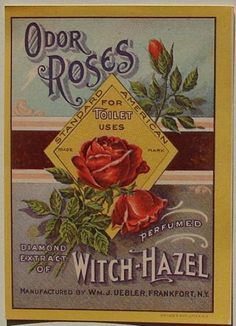 There are accounts of hazel and witch hazel being used for fishing rods or poles, and it is difficult to know from many accounts whether the writer meant the hazel [hazelnut], the witch hazel, or the wych-elm that was used in olden times in England. While witch hazel is native to North America (with versions also native to Japan and China) it put in an appearance across the pond early on. “Hamamelis virginiana was one of the first New World plants to be adopted for ornamental use by European horticulturists. As early as the mid-17th century, the plant was growing in private botanical collections in London. And it’s been a perennial favorite ever since.” – The Brooklyn Botanic Garden website. http://www.bbg.org/gardening/article/winsome_witch-hazel. The Positive Medicine web site in the UK noted a collaborative effort between John Bartram and an English gardener to distribute witch hazel in England. Peter Collinson, an English cloth trader and avid gardener bought various plants and seeds from America and distributed them to English botanical gardens. “The Father of Fishing, Izaac Walton, can be consulted for an account of making rods. By Walton’s time hazel as in hazelnut, witch hazel, and the wych elm for which the North American witch hazel is named were all growing in England. An account of rod-making in England from April 22, 1870 may be of interest. “I have been told, very good fly rods may be made of mountain ash, also of wych elm and of hazel…”. – English Mechanic and Mirror of Science. An American writer thought witch hazel wasn’t of much interest to the professional rod maker or fisherman, but that, “many a witch hazel fish-pole has augmented the truant boy’s strong of forbidden fruit down the creek bank in the first warm days of spring. Down South where witch hazel is scarce and scrubby, its cousin, the famous red gum, is cut short in its career and lifts fish from the ‘Swanee’ river and other southern streams famous in song and story.” – Hardwood Record. June 10, 1917. Another American wrote, “He had a witch-hazel pole which he had cut in the winter and from which he had scraped the bark, to make it look nice. He kept it on the rafters of the woodshed…”. Munn, Charles Clark. Boyhood Days on the Farm: A Story for Young and Old Boys. 1907. Boston. Because the forked branches were thought to possess magical powers of pointing to hidden streams or veins of metal [gold, silver, coal] they were used as divining rods by well diggers and would-be miners. It was sometimes referred to as the witch of the woods because it bloomed out of cycle with most other plants and shrubs. 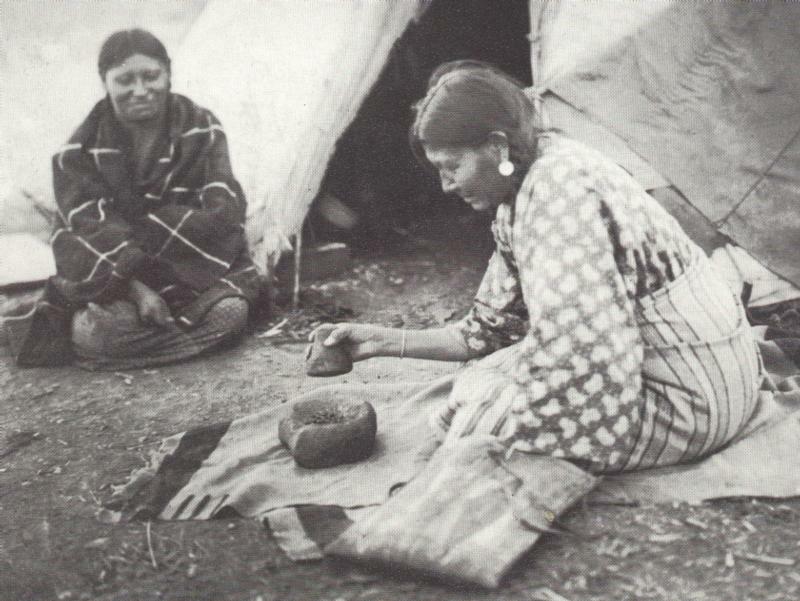 Native Americans, “put great faith in it as a sedative and application to external hurts and inflammations. They still the leaves and bark, and bathe sprained joints and muscles. They apply it for all their burns, bruises, and aches. It quickly takes out the smart and sting and allays the inflammation, lessening the swelling and restoring the hurt to a normal condition. Likewise I have seen them use it for weak and sore eyes, sores in the ear, nose, throat, or mouth, and for sore throat too. As a relief to the bites of insects most of us are familiar with it, while many of us have used it with good results for our lame backs and rheumatism…”. The penner of those lines noted Indian women mixed it with oil and used it as a beauty product for the skin. – Life and Health Magazine. April 1912. The following description may help interested parties to find the bush in the wild or to know when purchasing if they are indeed purchasing true witch hazel. “The witch hazel leaf is nearly as broad as it is long, bluntly pointed at its tip, with a stem generally less than one-half inch in length. The sides are unequal in size and shape and the edges are roughly scalloped.”. What Surprises are Lurking in the Milk in Your Fridge? Have you ever considered there could be anything other than fresh natural milk in the milk product you offer your children? In 1994 artificial growth hormones made their way into our milk supply and with the exception of some organic milk hormone-laced milk became pretty much standard within 2 or 3 years. How can this be and more importantly WHY? It seems that cows injected with recombinant bovine somatropine (rBST) and recombinant bovine growth hormone (rBGH) tend to produce approximately one gallon per day more milk than cows not treated with it – at least for a while. If we were a starving third world nation boosting quantity might take precedence over health concerns but as we’ll see, using it seems to benefit only one faction – the company that produces the hormones. First, from a farmer’s perspective, a little research shows that the hormones aren’t good for the cows and they certainly aren’t good for people. Cows have more problems with cystic ovaries and uterine disorders, lower birth weight and shorter periods of gestation, and a greater risk of clinical mastitis (an udder infection) that requires antibiotics. What does such an inflammation mean for our milk supply? “The most obvious symptoms of clinical mastitis are abnormalities in: The udder such as swelling, heat, hardness, redness, or pain; and the milk such as a watery appearance, flakes, clots, or pus”. Yum. Treated cows may begin to have reduced milk yield, increased body temperature, lack of appetite, sunken eyes, diarrhea and dehydration, and reduction in mobility due to pain in the udder or lethargy. The UK study from which this information came says also that while the overall protein content in the milk may be unaffected, changes in the types of protein present may be affected by the leaching of low-quality blood serum proteins into the milk. Casein, an important protein, can be significantly reduced and casein is closely linked to calcium levels in the milk. Milk with pus in it sure sounds tasty on my cereal or in the ice cream we go through by the gallon. Think it doesn’t make it into your Turtle Tracks? Then why did Breyer’s Ice Cream recently announce that it is going to stop making ice cream from milk impregnated with growth hormones due to consumer demand? Canada, the European Union (some 27 countries), Japan, Australia, and New Zealand have had bans in place on rBGH, yet the U.S. has no restrictions and Monsanto, the producer of the hormones, filed a lawsuit against a dairy that advertised their milk contained no growth hormones. It seems pointing out that a brand of milk comes from hormone-free cows causes consumers to wonder what is in other brands then start to wonder how consumption of it affects them. The potential for health endangerment from these dairy products varies greatly from one source to another, and like many situations it comes down to the consumer making an educated decision on whether or not they’re willing to chance it. The www.cancer.org website downplays the risk of increased Insulin-like Growth Factor 1 (IGF-1) levels in milk produced by cows that have received growth hormone but concludes its report with, “The evidence for potential harm to humans is inconclusive.” They also conclude that the increased use of antibiotics necessary to clear up rBGH induced mastitis in cows does promote the development of antibiotic-resistant bacteria, but the extent of harm in humans is unclear. Really? We’re being told not to over-use antibiotics because it may have the same affect, but it’s OK to pass on antibiotics to our children through the milk they drink? What is IGF-1? “An elevated content of IGF-1 has been suggested to have adverse implications for human health and cancer frequency”. Milk from rBGH-treated cows does have much higher levels of IGF-1 according to www.responsibletechnology.org, and puts consumers at, “a high risk factor for breast, prostate, colon, lung, and other cancers.” They feel that levels of IGF-1 can be up to 10% higher than in milk from un-treated cows. Their studies indicated that milk from rBGH-treated cows with increased IGF-1 levels may increase the rate of fraternal twin births in humans. In the U.S. the number of fraternal twins was said to have grown at twice the rate as the UK where rBGH is banned. Is the danger being downplayed for economic reasons? 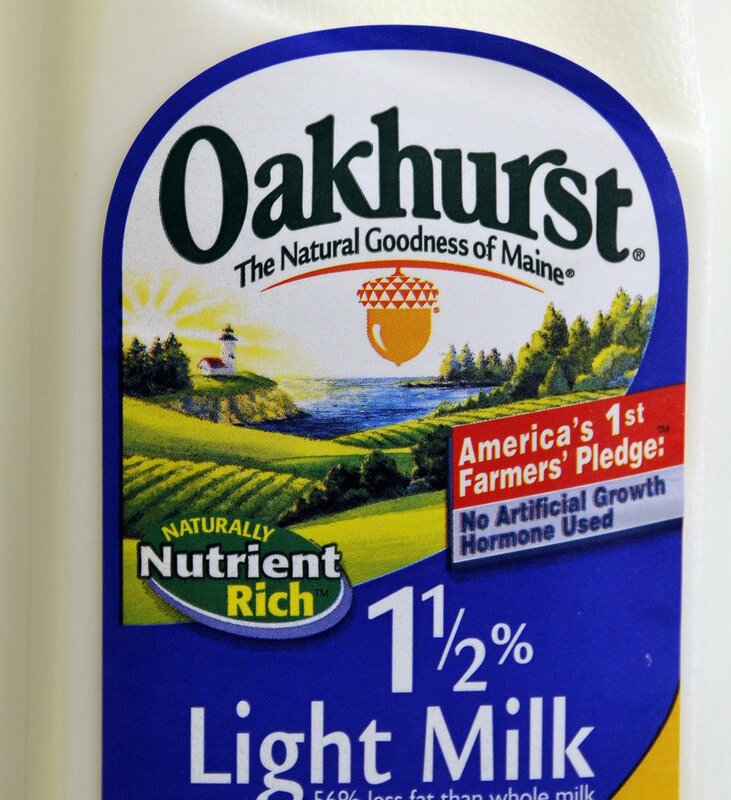 The Responsible Technology website, notes that after being sued by Monsanto in 2003 Maine’s Oakhurst Dairy’s farmers’ pledge, “No Artificial Growth Hormones”, had a sentence appended which stated that according to the FDA no significant difference has been shown between milk derived from treated and untreated cows. Responsible Technology says the studies showed milk from treated cows did contain increased IGF-1 levels and, “higher amounts of pus and antibiotic residues”, and claim further that the additional wording added to the Oakhurst label was written by the FDA’s deputy commissioner of policy, Michael Taylor, previously Monsanto’s outside attorney who, after running policy at the FDA, became vice president of Monsanto. How do these situations come about? Perhaps because consumers have been too complacent and let big business decide what goes into our food. Doesn’t some agency control the safety of food additives? Let’s look at both sides of that coin. Oct. 25, 1998, Phil Angell, Director of Corporate Communications for Monsanto was quoted by the New York Times Magazine saying, “Monsanto should not have to vouchsafe the safety of biotech food…Our interest is in selling as much of it as possible. Assuring its safety is the FDA’s job”. The FDA, however, issued this statement, Federal Register, Vol. 57, No. 104 (1992): “Ultimately, it is the food producer who is responsible for assuring safety”. It would appear that no one is on watch. Concerned consumers should definitely read the entire Responsibility Technology report for themselves found at http://www.responsibletechnology.org/gmo-dangers/gm-hormones-in-dairy. Be sure to follow the links to fact sheets on rBGH, and to reports from such credible sources as the Oregon Chapter of Physicians for Social Responsibility. Certified organic milk is supposed to be free of rBGH residues. It is hard to compile a list of non-organic brands which claim to be rBGH free because the list changes as companies such as Breyers agree to use milk from untreated cows. Read labels and do the online research, beginning with these brands: Alda Dena, Albertson’s, Alpenrose, Andersen, Ben & Jerry’s Ice Cream, Breyers Ice Cream (recent change), Brown Cow Farm, Crowley Cheese of Vermont, Dannon, Darigold, Eberhard’s, Franklin County Cheese, Fred Meyer/Mountain Dairy, Grafton Village Cheese, Great Value, Great Hill Dairy, Horizon, Kirkland, LACTAID, Lifetime Dairy, Lochmead, Mallories, Market of Choice, New Seasons, Noris, Pacific Village, Safeway, Stonyfield Farms, Stremick’s Heritage, Sunshine, Trader Joe’s, Umpqua, and Yoplait yogurts. RBGH free regional brands include: (West coast) Alpenrose Dairy, Berkeley Farms, Clover Stornetta Farms, Joseph Farms Cheese, Sunshine Dairy Foods, Tillamook cheese (cheese only, they do not make all their products – for example their butter is made by Land O’ Lakes and packaged by Tillamook), Western Family, and Wilcox Family Farms. (Midwest) Chippewa Valley Cheese, Erivan Dairy Yogurt, Promised Land Dairy, Westby Cooperative Creamery. (East coast) Blythedale Farm Cheese, Crescent Creamery, Derle Farms (only products bearing a ‘no rbST label), Erivan Dairy Yogurt, Farmland Dairies, Oakhurst Dairy, Wilcox Dairy (only products with labels indicating rbST-free). Stores carrying these brands can be found online but well-known ones include Trader Joe’s, Whole Foods, Walmart, Sam’s Club, Costco, Albertson’s, etc. Most stores carry Lactaid brand. Be aware that while a brand of milk may be hormone-free, other products bearing the same brand name such as butter, ice cream, cheese, or yogurt may not be, as in the case of Tillamook.